SNAFU! : Wrong title! Italians order LC23 landing craft! Wrong title! 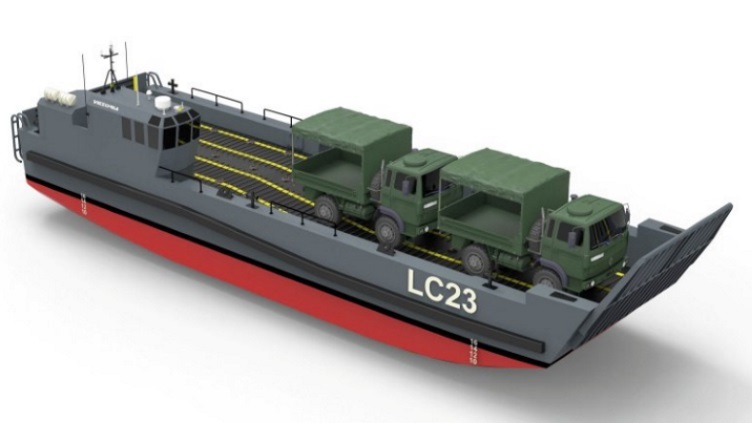 Italians order LC23 landing craft! Italian shipbuilder Cantiere Navale Vittoria is building four new LC23-class mechanised landing craft (LCMs) for the Italian Navy. The four craft, designed to equip the service’s new landing helicopter dock (LHD), are being built under a contract awarded by Fincantieri in the first quarter of 2017. The new LHD is scheduled to enter service in 2022. Construction on the first LC23 has already begun at Cantiere Navale Vittoria’s yard in Adria, near Rovigo. Under current planning the first landing craft utility (LCU) will be delivered in the second half of 2018, with all four units to be completed by 2021. With an overall length of 23.8 m and a beam of 6.6 m, the roll-on/roll-off LC23 is capable of transporting a maximum load of 65 tonnes (one Italian Army Ariete main battle tank [MBT]) at a top speed of 13.5 kt. Alternatively, it can transport a maximum of five Lince light multirole vehicles or 300 soldiers. The LC23 LCM will be capable of reaching top speeds of 22 kt (at light displacement) or 16 kt (with a 30-tonne load). It has a 200 n mile range at 14 kt. As an alternative to one Ariete MBT, the new craft will be capable of transporting two AAV-7 assault amphibious vehicles or two M109A2 self-propelled howitzers, one Centauro armoured vehicle or one Freccia armoured infantry fighting vehicle. Maximum displacement is 155 tonnes (including a maximum 65-tonne payload). The LC23 features a steel hull and aluminium steering station superstructures with ballistic protection. It is equipped with a stern gate for loading and unloading vehicles onto landing craft within the well dock (up to a maximum limit of 30 tonnes for the transfer of vehicles in this configuration). Based on requirements set by the Italian Navy for LHD well-deck operation limits, Cantiere Navale Vittoria’s LCM design features a propulsion system based on two 1213 kW rated MAN D2862 LE 453 diesel engines each connected through ZF3055 transmissions to fixed pitch propellers. Nothing really interesting here except....the Brits are cutting their amphibious forces while the Italians, Spaniards and Greeks have been able to maintain their forces under intense economic strain. At this time we see the Turks, Japanese, S. Koreans and even Brazilians (thru the purchase of Brit LHDs) build up and expand their forces. How are those nations able to maintain and/our expand their amphibious forces while the Brits are forced to savagely cut what was once a wonderful and world leading capability?